Jute leaves dwell in memory. Jute was what people lived off, it was what they ate, in a land where there were many rivers and canals, in places with different names--Dhaka, Mymensingh, Pabna, Comilla. The names exist even now, but it is a different country. For Bengalis who had to build a new life after Partition, jute leaves evoke memories of a home that no longer exists. It evokes memories of smell. As the finely chopped jute goes tender on the iron wok and the leaves lose some of their glueyness, a wild aroma fills the kitchen, smelling of the hot humid earth of the Gangetic delta, where jute grew in abundance. A dash of mustard kasaundi on the cooked leaves is likely to conjure up images of the little mound of steamy white rice with the cooked jute leaves neatly placed beside it on a big brass thal (platter). The bright yellow chutney of crushed mustard added just the right punch to let the flavours play on the palate for a while before they invaded the senses. 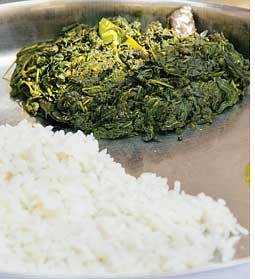 The jute saag (leafy vegetable) played its trick by increasing the desire for all the bowls that circled the thal. The fibre in the leaves ensured there was no constipation caused by all the overindulgence. The calcium-rich saag had its heyday in the 19th century when jute was an industry. The raw material that fed this industry came from the villages, where life and fortune revolved around this cash crop. The farmer was forever busy, processing the crop. Once the jute decomposed and the twine was beaten loose in knee-deep water, it was dried. Bullock cart after bullock cart laden with the "golden fibre" then headed for the local market. The creaking of their wheels was music to the cash-starved farmer who probably headed home for a meal of parboil rice and jute saag and of course, fish. From the villages of Bengal the jute travelled to England, where it was processed in the mills to feed the packing industry. Jute sacks, were widely used to pack almost anything, from food grain to sugar to cement. Eastern Bengal supplied raw material to all the jute mills of the uk and later, Kolkata. Around the time the region was reborn as Bangladesh in 1971 jute was fading out of the economy and consequently the cuisine. Nobody grew jute any more. But the refugees, when they crossed the newly drawn boundary line following Partition, carried with them memories of the land they left behind. The smell and taste of their favourite paat saag now got woven into the folklore of the diaspora.